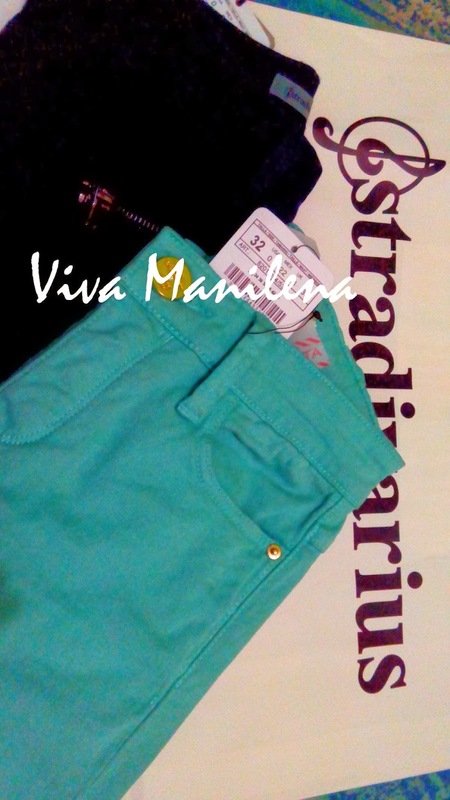 My daughter's been making hints about Stradivarius after seeing a mint colored jeans sometime November last year. Also, it is the only store that has her size. I mean, she's just a tweener so finding clothes that fits just right is sometimes impossible. Btw, I just love the name of the shop because it reminds me of this famous violin that once belonged to Gil Lopez Kabayao. Stradivarius is like the Rolls Royce of violin. Alas, the price doesn't agree with my wallet and I told Isabel to just enjoy first her new pairs from H&M which I bought last November during my trip to HK. Then last week, I had an unplanned errand in SM Aura and while waiting for my meeting, I saw Stradivarius and it has a S-A-L-E sign in front. Okay, I don't really have any plans to shop since I just had my fill of Uniqlo last February 14. Then I espied the mint green jeans at 50% off. Wow! And Isabel's going to celebrate her birthday in a week's time. How lucky can I get. So I got her the mint green that she likes and then got another pair (indigo). She almost saw the jeans when I arrived home that night but I just said that I got the paper bag from a friend. Good thing she's not the type who peeks inside bags and stuff. So now, Isabel's been enjoying her Stradivarius skinnies. I'm amazed at how easily her legs fits in the jeans- hahaha.